Chelsea are facing Barcelona this week in the second leg of their Champions League tie, and that means wall to wall coverage in the Spanish sport media. There’s a great deal of excitement which is added to because of the built up rivalry between Chelsea and their Catalan opponents. 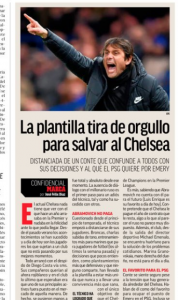 Antonio Conte’s situation at Stamford Bridge is also the subject of several columns, including one from Marca on Tuesday which details a mess at Chelsea. In a ‘confidencial’ section, so implying they have inside information, Marca state everything started to go wrong with the handling of Diego Costa. For Conte, ‘the estrangement with Roman Abramovich was total’ and when that starts to happen there’s usually only one outcome. 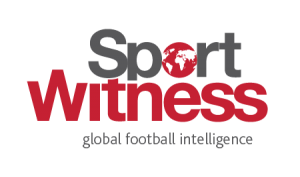 Players have been unhappy since, with continual leaks to the media (often in Brazil), and the Spanish newspaper believe Chelsea are something of a rudderless ship at the moment. It’s even stated the exit of Michael Emenalo has left the club ‘orphaned’ in respect of sorting out day to day issues, with Marina Granovskaia uninterested in the day to day running. Luis Enrique is once again named as the man likeliest to take over from Conte, something which is now being reported repeatedly in Spain.